Nature’s bounty is not limited to, air, light and water. Its generosity has also provided us with gemstone worth millions. They are formed by simple molecules or individual elements in repeating chains, sheets or three-dimensional arrangements. These molecules are differently arranged in different gemstones, which determine the characteristics of the stone. In fact, the gem information can be done on the basis of the arrangement of the molecules. Minerals, typically are formed when molten rock or magma cools or separates when in contact with cold water. In general, mineral particles are small because of their formation in confined areas such as lava flow or between grains of sediments. Some common minerals that are found in most of the gemstones include gold, tin, iron, marble and granite. Silicates are also the most common form of minerals, apart from oxides, sulphides, sulphates, carbonates, halides and other major mineral classes. Minerals also form beautiful crystals, and the most prized among them are gemstones. It must be mentioned here that uncut gems look like rocks It is only when they are cut that they get their brilliance and clarity. Interestingly, gemstones have been classified into precious an semi-precious classes. This depends on the way the minerals have coagulated to form the gemstones or how abundant they are. They are made of carbon atoms are considered to be the hardest material on earth. In fact, diamond cutters are used for cutting glass. Diamonds are found in various places on earth and are formed under extreme temperature and pressure. They are formed by minerals called beryl, which has a chemical formula with a mix of beryllium, aluminum, silicon and oxygen. Additional traces of Chromium and Vanadium lead to the color which the gemstone offers. Different trace elements can produce different colors, allowing beryl to form semi-precious stones like the aquamarine. 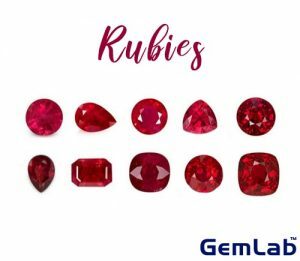 Ruby gemstone is formed of a mineral called corundum, which comprises aluminum oxide. The red shade is formed by dashes of Chromium present in it. Corundum also forms sapphires in several colors caused by the presence of trace mixtures of iron, titanium and chromium. Some other gemstones and their mineral would be Albite for moonstone, Almandine for Garnet, Almandine-Pyrope Garnet for Rhodolite, Amber for amber, Grossular for Hessonite, Jadeite for Jade, Lazurite for Lapis Lazuli, Opal for opal, Topazz for topaz, Turquoise for turquoise. Some factors that classify minerals and gems are hardness, luster, color, density and magnetism. They are also identified in the manner they break or the type of streak they leave with a streak tool. You can get more information about different gemstones and their composition from the Internet. Otherwise, you can also speak to a certified gemologist who would be able to guide you with authentic and certified gemstones. You can buy original gemstone online too, and get information from branded jewelers who also have great knowledge about various precious stones. How Yellow Sapphire Help To Travel Abroad?